Downs by the Bay: Wet Beaches, a New Soul and Presents! Wet Beaches, a New Soul and Presents! I intended to write about this earlier, but I wanted to be sensitive to my readers living on the south coast before I expounded on receding shorelines and rouge waves. I hope you and your loves ones are safe and sound. When you think of Brady P., the first thing that might come to your mind is throwing rocks. We still do that at least once a day because the weather has been lovely. But as fall approaches, sometimes we are missing a part of the equation when we get to our spot for the day. The increasing waves and rising Lake Superior tide has been playing tricks on us. 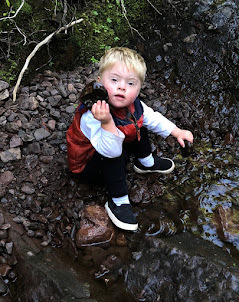 I like to have Braeden throw from the "dry rocks," but there have been days without dry rocks. That means that the waves ebb and flow so far up, we could get swept away by a rouge wave. We have shifted our throwing spots so far back that sometimes we have to find a different spot all together. One of our places was void for most of the summer. As we sit in our tiny spot of dry rocks (or say "screw it" and sit in the wet ones), I have to watch every wave. I know her Majesty's waves usually come in threes, so if one splashes up higher than the rest, two more will probably do the same. I have had quite a few instances of scooping little Brady P. up while he was mid-toss and running him back a few feet. Sometimes he is already wet. I really concentrate up to that point, and squeal when they are getting close. Oh my gosh, we have so much fun. Brady P. catches on too. He is a meditative soul, and I have caught him becoming one with the waves several times. This occurs when the waves come up higher than usual, and he knows he is in potential danger of wet pants. He stares at each wave as it rolls in. His body does this slight undulation in correspondence with the incoming waves. He looks mesmerized, yet peaceful and expectant of the next splash. I can almost guess what he is thinking because I do the same thing. You will have to do it yourself, and see what you think. Of course, he is not always on cue. Like last week we were out on the shore with a friend. I was busy reading parts of my memoir to my friend Bryce, and next thing we knew - ploop! Little Brady P. was floundering in the brisk water on a calm, sunny day. He came out drenched and livid, but that was his first immersion in Lake Superior, so we figured it was his baptism. His soul is wiped clean. My soul gets pretty clean out there too. I can't even believe how fortunate I am. Here I am, a full-time mom, living the life some people only dream of. I get to spend time on the beach with my son, and, at the same time, I am working. While I'm on the shore listening to splooshes, I have my notebook ready to harbor the inspirational thoughts that cross my mind. Many of my latest ideas and business plans have been created while my toes were getting wet. I have also been picking rocks for work. Now, beach-combing has never been my thing. I never had a purpose for rocks from the shore. Just you wait, my friend. I am creating bookmarks. Bookmarks with a translucent Lake Superior stone on the top to remind you to stay solid in form while the light shines through you. They will be almost as inspirational as my memoir itself, and one in every 20 pre-orders for that book will get a free bookmark! I'll let you know when they're ready. So, yes. I've been busy. I'm so excited for life right now that I can hardly contain myself!!! I can't wait to release my next round of concoctions to the world. And you will be part of it. If you surely don't want to miss it, please click here to learn how to get these posts delivered to your inbox. Thanks so much for wading through another post without a picture. As a present, here is a video I took in 2007 of the waves blowing in near the Copper Harbor lighthouse. Please turn your volume down a bit, as I was a novice recorder at the time, and the wind sounds horribly offensive through the microphone. And on a day like that, we wouldn't be throwing rocks. Click HERE to watch the video of the waves on Youtube. And a bonus present! Here is the Superior Trails color report for the Lake Superior areas. They even have a peak color predictor that they just updated. Happy fall!